Note: with the allocation of 5 MHz to Canadian amateurs on 22 Jan 2014, this experiment is concluded. (22 Nov 2002 - 22 Jan 2014) Thanks to all who contributed. MRCN in comments invited by IDESC noted that given there was no report of interference from either the VO1MRC or VX9MRC transmissions that the 15 watt ERP restrictuion should be eased. RAC and others provided helpful input. C21 (CAN-18) Amateur service operators may transmit in the frequency band 5351.5-5366.5 kHz and on the following four centre frequencies: 5332 kHz, 5348 kHz, 5373 kHz and 5405 kHz. Amateur stations are allowed to operate with a maximum effective radiated power of 100 W PEP in each channel and are restricted to the following emission modes and designators: telephony (2K80J3E), data (2K80J2D), RTTY (60H0J2B) and CW (150HA1A). Transmissions in any channel may not occupy a bandwidth of more than 2.8 kHz. Such use is not in accordance with international frequency allocations. Canadian amateur operations shall not cause interference to fixed and mobile operations in Canada or in other countries and, if such interference occurs, the amateur service may be required to cease operations. The amateur service in Canada may not claim protection from interference by the fixed and mobile operations of other countries. 18 November 2015. The Plenary Meeting of the 2015 World Radiocommunication Conference (WRC-15) in Geneva has approved an allocation of 5351.5-5366.5 kHz to the Amateur Service on a secondary basis with a power limit of 15 W effective isotropic radiated power (EIRP). 22 Jan 2014. Canadian amateurs are granted access to 5 spot frequencies on 5 MHz. Please see the particulars as outlined by Industry Canada. Existing and possible (red) amateur radio allocations below 7.5 MHz. Note that the proposed 5 MHz band is midway between the 40 and 80 metre bands. Also note the new LF allocation at 135.7-137.8 kHz. Frequencies: 5260, 5269, 5280, 5290, 5319, 5329, 5400 and 5405 kHz. Modes: A1A,J3E. Bandwidth: 3 kHz. Power: 100 watts. The Marconi Radio Club is enthusiastic about experimentation on 60 metres. Members have been monitoring the band, listening for UK and US stations. An experiment was proposed by J. Craig VO1NA and with the assistance of Dr Ken Pulfer VE3PU and Jim Dean VE3IQ, and the endorsement of Radio Amateurs of Canada, was approved by Industry Canada, the national regulatory body. The primary purpose of the experiment is to compare differences in propagation over distances up to several hundred miles on the 80,60 and 40 metre bands. A report will be prepared for publication in "The Canadian Amateur", the national magazine for Radio Amateurs of Canada (RAC). 9-10 November. Several QSO's on 60 metres. 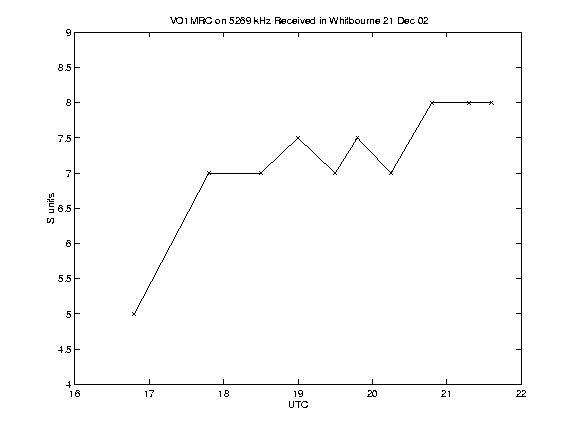 June 2012: VX9MRC is authorised to transmit on 5 60m spot frequencies. April 2011: Several Canadian stations began using 60 metre spot frequencies under developmental (VX9) licences. 2010: A report has been prepared and was published in the November-December 2010 issue of "The Canadian Amateur" pp 33-34. It is anticipated by RAC that access to 5 MHz will be granted to Canadian Amateurs in the fall of 2011. MRCN extends many thanks to all who assisted with the operation. June 2007: We are most grateful to the following amateurs who had QSO's and/or provided signal reports of the June 2007 60 metre operation: FP5CJ G3TXL G4TRA GI4VIV K2MUB K4AVC K8EUR K9HMB VO1BC VO1DK VO1HLD VO1PWF VO1RYL VO1UG VO1UL VO1WIZ VOT1A W1JR and W3UR. As a result of unfavourable conditions during the last operation there will be another on 2300 UTC 21 June 2007. This will be simplex CW or USB on any of the frequencies authorised by Industry Canada. 13 June. Adjusted CW tone and symmetry, checked TX frequencies. 12 June crossband (5327.5 and 3740.0 kHz) QSO's and reports were received from VO1UL FP5CJ VO1HLD and VO1UG who reported periodic variability of the 5 MHz signals. 12 June 2007. After tinkering with the crystal controlled Marconi CH-150 and a home-built DDS, we may now have access to all frequencies authorised by Industry Canada. Simplex QSO's may be possible on 5403.5 kHz. This development occured after RAC published the bulletin for the 15-16 June operation at which time only crystals for 5260, 5269 and 5329 kHz were on hand. 5 June 2007. Reports/QSOs from VO1s BC PWF RYL UG DK and UL and FP5CJ. TX 5327.5 USB RX 3740 LSB. TX about 20 watts to inverted V dipole at 10m. 6 June: QSO's with VO1s BC UL UG and WIZ 60/80 m crossband. 5-6 Oct 2006. QSO/Reports from VO1XC VO1TA VO1VCE VO1UG VO1MX VO1YR G4TRA while transmitting on 5260 and listening on 5258.5 and 3740 kHz. 28 March 2006: The experiment has been extended by Industry Canada. Thanks to Jim Dean VE3IQ, an extension of the authorisation has been recommended to IC by RAC. February 2006: MRCN was QRV on 60 metres for 'activity day'. 13 Jan 2006 ~2300 UTC TX 5327.5 USB RX 3740 kHz LSB. Thanks to VO1TA for the report from across the island. Thanks to P. Widger, VO1UL VE7JKZ G4FSU KQ1A and W1DJK for their participation in the October 2005 operation. 22 Oct 2005 0100 UTC Beacon on 5269.5 kHz for 23 hours. 23 Oct 2005 As above. 10 October 2005. Another operation is planned for 22 October 2005. This will involve the operation of a beacon on 5269 kHz although there may be some 2 way on 5260 kHz CW. 25 Sept 2005. VO1NA and VO1XP did some brief testing on 5260.5 and 5269.5 kHz. 8-9 April 2005: VO1HP operating VO1MRC has 8 contacts as part of the 60 metre activity day. Thanks to the efforts of Frank, we can now use all 8 of our assigned frequencies on 60 metres for a while. Local propagation experiments are being planned and will be announced soon. 30 March 2005: The Marconi Club will be representing Canada in the 60 metre Activity Day (8-9 April). 16 Mar 2005: Authorisation from Industry Canada has been renewed for 1 year. 24 Feb 2005: Jim Dean of RAC endorses a continuation of the experiment. We expect Special Experimental LOA to take effect on 1 Mar 2005. 24 Jan 2005: The half wave tower collapsed during a heavy ice strorm, preventing a winter comparison of high and low wave angle propagation. Other experiments are being considered. We hope to have our authorisation extended. Phase 5 of the experiment starts in February 2004. An announcement soliciting participation of Newfoundland Amateurs was made on the Evening Traffic Net on 3740 kHz on Monday 23 February. To participate, you should have have receive capabilities on 40 and 80 metres and 5.2 MHz. 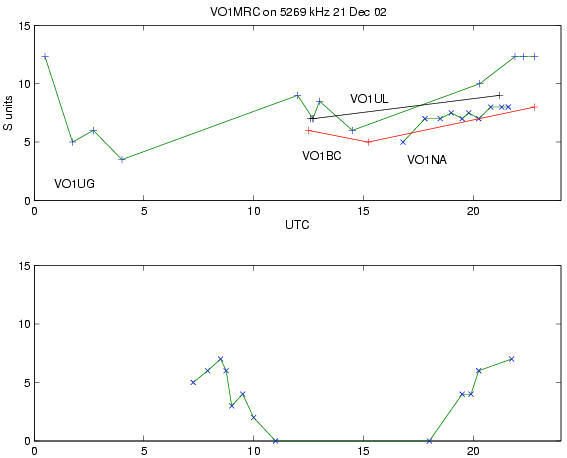 VO1MRC will transmit beacon signals on 5269 kHz and the strength of these signals at different times of the day at different locations will be determined. This can be read from an S meter on your transceiver but it is important that the settings and antenna be the same for all readings. As of 6 April 2004 the following have participated in the fifth phase of the experiment. GI4VIV G4CAO G3GXQ VO1's LV UG PJN DD DAD UL ABN TA VCE CBS RYN TK QS UG RAH ER QS. On 19-21 June 2004 it is proposed to conduct an experiment to compare wave angle differences and other activities. The beacon software written for the early 5 Meg Experiment work was revised to conduct the wave angle experiment. This involved toggling another RS232 line to switch the antenna and to transmit a code indicating a different aerial was being used. We hope to learn which aerial is most effective for a given range. This is a very simple experiment but may give some information on high angle performance over the short range (up to 500 km) for typical amateur aerials. A half-wave dipole inverted "V" with the apex at 10 metres and a half wave vertical will be used. Signal reports will be gratefully accepted. Authorised Dates: 22-25 November 2002, 20-23 December 2002, 20-23 June 2003, 23 September-31 December 2003, 20 February 2004-20 February 2005. Authorised Frequencies: 5260, 5269, 5280, 5290, 5319, 5329, 5400 and 5405 kHz. 8 November 2002. Drafted proposal, found 4 crystals that could give carriers in the 5.3 MHz range. Using a glass plate and about half a bottle of the XYL's gritty cleaning paste, ground a crystal from 5.255 MHz up to 5.260 MHz. Although this took over 2 hours and over a thousand figure 8 grinds, it was motivated by hearing GI3XZM calling CQ on 5.260 MHz and the foul mouth fishermen gracing 5.255 MHz. An internet signal report for GI3XZM was acknowledged and confirmed by Ian GI8AYZ who indicated that Des was "highly chuffed" by his signal being heard across the pond. 14 November 2002. Frank VO1HP hears and records the G3PLX LDE experiment transmission on 5280 kHz. A computer was programmed to send beacon text for the VO1MRC TX. Due to an inefficient algorithm, it sounds like the computer has a glass fist, ie: has a swing -- a bit of QSD. Interface comprising a 2N2222A, 15k resistor to base and the collector shunted to ground with 0.22uF, was used to key the tx. 17 November. Vertical halfwave aerial was inspected. Reconnected and soldered several radials. Due to an unfortunate mishap, ie. : grinding with excessive enthusiasm, the xtal for 5319 is no more. Netted the remaining crystals to work the following frequencies: 5260.5 5268.4 5328.5 kHz. The xtal case for 5268.4 is 4.4 x 4.0 x 1.9 cm, and is labelled "GEC Quartz Crystal Plate Made in England" and has the call signs G3LMD VO1FB and FP8BD etched on the side. I wonder who that is? Several stations volunteer to monitor signals from VO1MRC . 22-25 Nov 2002. The half wave vertical is tuned for 5.3 MHz despite the awkward transformation ratio and resulting high Q. VO1FB is the first to report reception of CW and SSB from VO1MRC on 5.328 MHz. Reports and/or contacts are acknowledged from: VO1JVA VE1DY G4UPS GI4VIV GI3PDN GI3XZM G3TXL G3DNF G3IFF VO1LV VO1QS VO1FJS VO1UL VO1CAL VO1TJM VO1BC VO1CWP VO1BP VO1UG VO1UL VO1EGH FP5CJ VE1AMA G4CAO VO1ABN VO1HP VO1MP. David Edwards in Hobart Tasmania (the oposite side of the world from Newfoundland) reported hearing CW on 5328 while VO1MRC was transmitting its beacon on this frequency. July 2003: US Amateurs permitted 50 watts (USB) on 5332, 5348, 5368, 5373 and 5405 kHz. UK Amateurs with NOV's have been operating on 5260, 5280, 5290, 5400 and 5405 kHz since 2002. March 2005. Norwegian Club stations can run 100 watts CW and USB on 5280, 5290,5332, 5348, 5368, 5373, 5400 and 5405kHz. 0000UTC Initial tune up and testing. The vertical aerial has been tuned and tested and determined to be operating properly. The transceiver has been properly adjusted to operate on 60 metres. It has been tested as a transceiver and beacon and works well. The SSB transmit frequency was 1 kHz lower than the corresponding CW frequency for a given crystal. Computer software to operate radio beacons and monitor signal strengths has been developed and tested. Substantial differences in propagation have been observed between 60 80 and 40 metres based on unstandardised signal reports. Methods of obtaining standardised signals reports have been discussed. Two way contacts were had with Newfoundland, Nova Scotia, Ireland, and England. Signals were heard in St Pierre, Tasmania and by a commercial station. The Marconi Radio Club of Newfoundland expresses sincere gratitude to all who have participated in Phase 1 of the experiment and contributed to its excellent success. 0000 Beacon for 24 Hours 5269 kHz. Apparent diurnal fluctuation or artifact? Note: time of dusk was approx 2000Z; path about 60 km, 30 km over salt water. Conclusion: more data needed before one can be drawn. Diurnal variability for local and transatlantic (bottom) paths. More data has been received thanks to: AA1VX DL8AAM F0DBD G0FHK G0HNW G3PLP G3SES G3TXL G3UNT G3YMC (First 60m QRP TA[jc 13/06/2007]) G3YMC G3ZBE G4AGE G4CAO G4LOP G4LOP G4UPS G4VXE G4WWA G5BM GM0HDR GM0HMR K2RT K2SMD OZ7DX PY2FUS PY2ZX VE2DWE VE3PU VE7CRO VE7HCB VK7RO VO1BC VO1HP VO1TK VO1UL VO1UG VO1XP W2MC W4IHK who either established QSO's or furnished signal reports of VO1MRC on the 5260.5 working frequency or the 5269 beacon frequency. These results will be processed in the near future. Many thanks to all who participated in Phase 2 of the 5MegEx. 0000UTC Test transmissions. Calls will be acknowledged on 5260.5 kHz CW. 0200UTC Beacon on 5269 kHz until 0930Z. 2200UTC Local tests. T/R 5260.5 kHz CW and USB for stations in Newfoundland. 2300UTC Beacon on 5269 kHz. 22,23 June. Beacon operation (5269) and QSO's on 5260.5 at 0000 ish. Although several contacts were had, no local quantitative reports were received to complete the experiment. Thanks to GW3KFA VO1BC MM0BSM VO1FJS GM0HMR GI4VIV DE8AAM I3-65709 DL-L14/2381499 and P. Widger and others (to be added later) for providing signal reports/contacts during phase 3 of the experiment. Phase 4: A request for an extra phase has been placed with Industry Canada by Radio Amateurs of Canada on our behalf. On 24 September, notification of authorisation was received. 27 October the first America-Canada 60 metre QSO took place between Rick N1RL, ARRL Sr News Editor and Joe VO1NA RAC Section Manager, NL. For more info, see the ARRL news. 2330 0030 UTC TX/RX 5329 kHz USB/CW 26/27 Sept 2003. 2230 UTC TX/RX 5260.5 kHz CW daily as time permits. 04 Oct 2003 0001 UTC Beacon on 5269 kHz for 24 hours. 23 Oct 2003 2230 UTC TX/RX 5260.5 kHz CW. 29 Oct 2003. 0030 UTC. TX 5327.5 USB RX 5346.5 USB. 30 Oct 2003. Major GM Storm. Another experiment is scheduled. See the RAC Bulletin and the ARRL news item . 20,21 December 0000-2400 beacon on 5269 kHz. 0000 TX 5269 CW RX 5269 CW TX 5327.5 USB, RX 5346.5 USB 3807.5 kHz LSB. 24-31 December. 0000 UTC TX/RX 5260.5 kHz CW daily as time permits. Special thanks to: DF2PY G4CAO G4FSU HB9BJJ K1OF K3QO K4DY N1RL N4CH N4UM N9NS OE1SOW ON5EG VE3JCV VE3PU VE7NGR VE9HC VO1ABN VO1DD VO1PJN W1OO W2JB W3BQG W4MBD W8AC W9VP who completed 2 way contacts or provided signal reports for Phase 4 of the 5 Meg Experiment. Greetings were exchanged between RAC MAR SM and NL SM on 60 metres during a crossband QSO with Hugh VE9HC. On 21 DEC 02 at 1040 utc Ric, VK7RO heard VO1MRC (449) on 5269 kHz and replied on 7013 kHz (569) completing a crossband 60m qso. VO1MRC ran 90 W to a half wave vertical. 20 Feb. Letter of Authorisation has been received for MRCN to resume experimentation on 5 MHz. Thanks to RAC. 21 Feb. TX/RX 5260.5 kHz 2300 UTC. 19,20 June 2004. UTC 0000 TX 5260.5 CW RX 5260.5 CW / 5346.5 USB. Then TX 5327.5 USB, RX 5346.5 USB / 3807.5 kHz LSB. Followed by beacon on 5269.5 kHz, switching between the vertical and dipole. Please Note: The start time on the 19th could be delayed an hour or two. Signal reports are gratefully acknolwedged from: VE9WGS, WB9FJO VO1UL VE4OV NB1B and VA3QSL. The results will be tabulated. NOTE: Please feel free to provide a link to this web page. No material in this document or other documents to which it is linked may be copied on the internet or otherwise without the prior written permission of the authors and an acknowledgement of the Marconi Radio Club of Newfoundland.